Post-graduate planning is a crucial component of a student’s life at BDEA. The Post-graduate Planning team does everything from starting the conversation about post-high school graduation options with every BDEA student, to providing additional, inspirational counseling through the final trimesters, to supporting students interested in careers as well as in attending college. 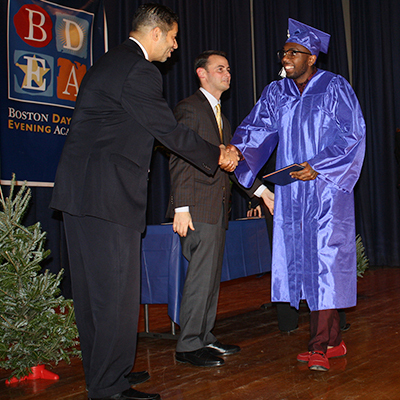 In between enrollment and the final, Capstone trimester, the PGP team offers career readiness classes that incorporate habits of success, partners with organizations that connect our students to jobs (The Boston Private Industry Council); helps them think about college choices (College Advising Corp); and connects homeless/unaccompanied youth with appropriate shelter (YouthHarbors). Early College and Career pathways – We continue to develop college/career pathways that link our students to a partner organization with expertise in a particular career and with a strong record for job placement. Dual Enrollment – We are expanding our DE options, which already include Benjamin Franklin Institute of Technology, Bunker Hill Community College, and Roxbury Community College.